Discover the novels that inspired the hit ITV series Midsomer Murders, seen and loved by millions. 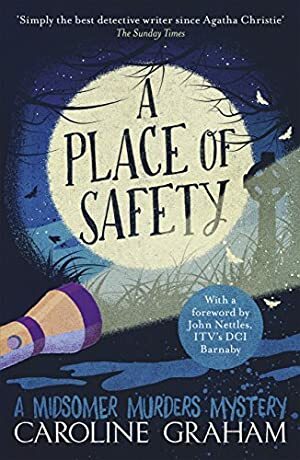 A Place of Safety by prize-winning writer Caroline Graham is the sixth Midsomer Murders novel starring much-loved Detective Chief Inspector Barnaby. Featuring an exclusive foreword by John Nettles, ITV's DCI Tom Barnaby. Perfect for fans of Agatha Christie, Ann Granger and James Runcie's The Grantchester Mysteries. Everyone deserves a second chance - or at least that's what ex-vicar Lionel Lawrence believes when he decides to open up the old rectory to a stream of young offenders. Lionel only wants to help these poor souls, but his good deed quickly spirals into a deadly mix of blackmail and murder. Detective Chief Inspector Barnaby is sure he knows who is behind the disappearance of Lionel's latest young charge. Will this elusive suspect prove to be the incarnation of evil itself? Log In to track Caroline Graham on eReaderIQ. to be notified each time the price drops on any book by Caroline Graham. to stop tracking Caroline Graham. We started tracking this book on February 12, 2015. This book was £4.31 when we started tracking it. The price of this book has changed 4 times in the past 1,534 days. The current price of this book is £0.99 last checked 2 hours ago. The highest price to date was £4.99 last reached on July 16, 2015. This book has been £4.99 one time since we started tracking it. We last verified the price of this book about 2 hours ago. At that time, the price was £0.99. This price is subject to change. The price displayed on the Amazon.co.uk website at the time of purchase is the price you will pay for this book. Please confirm the price before making any purchases.